I use the term fortunate because "luck" is already a specific component of the game mechanics. I refer to being fortunate as how often matches occur when you refresh your critters. I have noticed that when I am favored in a match (especially in Hero arena and Hero Challenge) I tend to be rather fortunate. Meaning, I tend to get matches often when I refresh my creatures. When I am not favored in a match (have a lower power score) than my opponent, It seems I am not very fortunate, but my opponent is. Is this built into the programming of the game? If so, I feel that this needs to be reworked. If I am going against a stronger opponent, I am already at a disadvantage due to having creatures with a lower power score, I shouldn't also have to overcome an advantage in my opponent's ability (good fortune) to more readily make matches when they refresh. I feel that eliminating this built-in extra advantage will eliminate a lot of the feeling of "unfairness" that a many people complain about in the Hero Arena and Hero Challenge. If I am going against a tougher opponent, I want all other factors to be equal so I have the best chance of using strategy to overcome them, and not be a victim of them getting stupidly obvious extras matches when I can't make a single match on a refresh. Likewise, if I am going against a less powerful opponent, they should have the same tendency to make matches on a refresh as I do. It should always be an even playing field, but once again, it feels as though the top players have an advantage here, and that needs to be addressed. Man, I would love some clarification on this from the dev. team. I was on a roll in the Master I and II leagues, but now that I am in master league III, all of a sudden I am not getting the matches on draws like I was before. I have grown a habit of "gambling" on the draws. For instance, I could make a match with my last move of a turn, but rather choose to refresh my creatures. More often than not, that match will occur with the refresh, and as an added bonus it would sometimes match more than one column. That is what I got used to and it seemed to be working well with the game's algorithms. Now that I am in a tougher division, I notice my good fortune is not what it was in the lower leagues. Is that how the game is designed, or has my good "fortune" run out? Does anybody (or the devs) have some insight on this? I am getting so frustrated going up against players who are equal footing as me, but getting miraculously good draws, and I lose. Even one player, in particular, that I keep going up against in Hero Arena uses the exact same lineup as me (Valk, Dazz, Rock, Tusk), but has all level 5s, I have all level 6s, and the "AI" has beaten me with that squad 4 out of 5 times (all because it got insanely good draws and gave me crap) and wrecked my chances at a top 3 spot. Do other people have similar experiences? Please share! I believe this for a few reasons. 1) It's an automated bot that is controlling the minions on the other end. It's ability to see, spot patterns, and have programmatic decisions be made, will likely have a more consistent success rate at making "power plays" because it is programmed to do so compared to a human player. There's "human error", generally speaking because players may not see those moves, take their time to identify a more "impactful" move and are just pre-disposed to making moves they "feel" like are right vs. being programmed to make. 2) It "feels" more biased against you sometimes because when you "REALLY" want it to go your way it feels more gut wrenching when it doesn't. Conversely you may be a little excited sure, when it does go your way, but it may not be an equal feeling as much as it hurts when you get "unlucky". It likely happens just as often when things "do" go your way, than when they "do not". 3) From a Development perspective this is a poor way to code things. With ALL the little intricacies and subtle interactions, developers don't want to make things even more complex from a maintainability perspective. If they ever have to make changes to their code this type of "extra code logic" dependent on extra specific details is harder to maintain and may end up just equating to more bugs and more headache to adjust in the future. Development patterns generally don't lean towards making more work for the developers. .
Are there likely difficulty settings they can tweak? - Of course, I'm sure there is... but I highly doubt they implemented things like you described in your posts above. Lower leagues are easy because of two things. (based on my observation) First, players on Master league may be on hiatus. And secondly, players are new so they have low-level creatures. On both cases, winning against the AI is easier. It is also expected that the higher you go up through the leagues, the harder it will be to win against other players. Denzik, you make valid and logical points, however that is not what I am witnessing. It does seem to me that players with either 1) have higher power score, and/or 2) are higher in the current league rankings, get better draws than I do much of the time. I don't have the data to back that up, and don't know if I am willing to take to time to catalog that data. It does seem logical to me that in the programming, power scores and league ranking can easily be factored into the algorithm for what kind of "fortunate" draws are made. Denzik, you've said it yourself, the "AI" puts minions in odd places at times and gets crazy good combos off the draws as a result -- this is exactly what I'm talking about, and it seems to happen more often when facing an opponent that has a higher power score and/or is higher in the rankings, especially when you get to being in the top 10 rankings of a league. Having lower level creatures are easier to beat -- of course -- and enables one to make more mistakes and still win, but a team of level 4s can beat a team of level 6s with the right draws. In hero challenge I've been able to win matches when my power level has been 1000 less than my opponent. It doesn't happen all of the time, but it happens. Conversely, I've been absolutely destroyed by teams whose power rating is 1000 less than mine. So far today, in hero arena (grandmaster III) I'm 2-8. All of the matches I play are winnable. I think that pvp in this game is super frustrating. It usually feels like I have to grind out wins, while the AI wrecks me in 2-3 rounds or comes from behind and dominates me seemingly from out of nowhere. I am so tired of b.s. beat downs in the hero arena. I was doing great in second place, and all of a sudden I get annihilated in 3 bouts in a row against weaker teams, which dropped me to 5th place, all because the "AI" got super obviously lucky draws. I really wish this game mechanic wasn't so erratic and left the battles up to skill and strategy rather than who gets the "fortunate" draws. So frustrating! So perhaps there goes my theory of better power scores and/or higher in the rankings equates to better draws. It may very well just be random as Denzik and others have talked about. It's too bad this potentially random component of the game overshadows skill and strategy much of the time. I’m not sure. Luck clearly plays a big role, but it does mean that everyone has a chance. I’ve lost count of the number of times my AI opponent has created a sun spell and then creamed me with it on the first go... but then I’ve also been in position to do the same back on other occasions. Could always reduce that chance by simply doubling or tripling each player’s starting health. I remember the days before I began playing Solgard... all the Candy games. When I first began playing Solgard I would warm up with a couple of Candy games. Could clearly see the patterns and the possibilities in those games, and would bring that strategy to Solgard. In using what I learned from the Candy games, and applying it in Solgard, it seemed to increase my "fortunate" opportunities. One thing that I think we are missing: we are not actually playing against another person, and our opponent does not gain or lose anything from the battle. They (devs) could set it so the we win every time (which would make the game boring) or lose every time (which would make people too frustrated). There has to be a balance in there for sure. What I'm trying to figure out is if there is some pattern to this, or a way to tip the balance in one's favor, or if things like power score or ranking in the arena have anything to do with it. One thing is for sure, when I was in the lower leagues (from Master III) working my way up to Legends, I definitely got more fortunate draws, than not, in the lower leagues. As I moved up, it seemed to become less frequent, so I'm pretty sure there's a "difficulty" metric that changes (lessens) the fortune draws the higher you go in the leagues. Anyone else have insight about that? PvP in this game is absolutely demoralizing. My teams consist of mostly lvl 6 and one lvl 7 creature with idols. I still get consistently destroyed by teams of lvl 5 creatures. I usually change my lineup depending on the teams I face, but it doesn't seem to matter. Having stronger creatures should make you feel powerful, but not in this game. 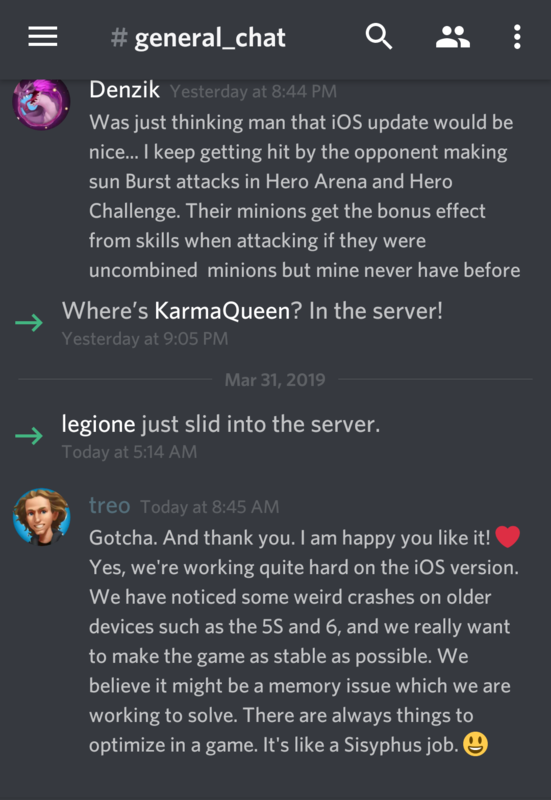 Check out today's post by Denzik on Discord regarding the 1.7 upgrade status. Might explain some of the problem. Solgard is currently AI, not PvP yet. @Meatbone I agree, it can be extremely demoralizing. You need to understand that bad beats are just part of the game. Eventually you'll find which level of HA is best for you. Choosing the right creatures for each battle certainly helps. Also, even though the opponents creatures may be a lower level, the level of their skills plays a big part, so pay attention to that too. You can always use the HA buffs (apple, potion) to help your cause. I think there might be some confirmation bias at work here. Because you lose more often to the higher power enemies, you remember the bad beats that caused it more often. They still happen against low power enemies, but don't always cause you to lose in those instances, so it "feels" like it didn't happen. It's clear from other factors that the RNG algorithm isn't purely random (for instance you will match up to a column of 2 much more often than 1/4 of the time and you will never match a row of 2 on its own and create barriers via the refresh, so...lol Raven Master and Redguard =/) but I'd be shocked if it was tuned to give better formations to higher power levels by nature.